Near the end of Stanley Kubrick’s The Shining, an enraged Jack Torrance (played intensely by the one and only Jack Nicholson) scours a wintery maze, axe in hand, searching for his son so that he can chop him into tiny little pieces. Although there’s (likely) no chance of this happening to you within the corn walls of the 10-acre Edmonton Corn Maze, just west of the city in Parkland County, there’s no reason why you can’t pretend that it is! Especially during the dark evening hours around the Halloween season, when the Maze doubles as the frightening Farm of Fear! 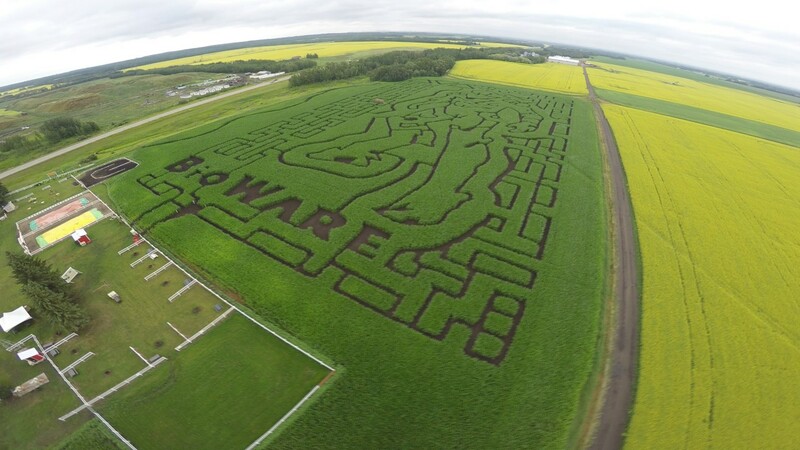 The 2017 version of the Edmonton Corn Maze is dedicated to the locally-established BioWare. But, if you’ve got young ones, then you might want to wait until the daylight before trekking the five kms of twists and turns of one of Edmonton’s favourite family attractions. Since 2001, the Maze puts out a unique design for every season (August to October), with past years resembling an oil derrick, a John Deere tractor, local Olympic curler Kevin Martin, and even Ryan Smyth of the Oilers.